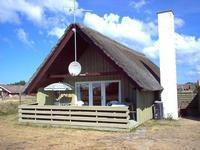 Hvide Sande is a well known Danish holiday destination with fine cottages. In Hvide Sande you have the opportunity to stay in holiday flats in a riding school with ample opportunity of riding every day. The holiday flats in Hvide Sande are 200 m from the North Sea. We also have ordinary cottages in Hvide Sande, where you can spend great holidays focusing on peace and contemplation with the North Sea as the next door neighbour. See the holiday homes in Hvide Sande on a map - click on the map! Cosy thatched cottage, 75 m2 for 6 persons in Nr. Lyngvig, Hvide Sande on a large nature site only 500 m from the North Sea. Sea view. 2 bedrooms and open loft. 6 persons 2 bedrooms Washing machine Woodburner Pets OK Distance to beach: 500 m.